The Dr. Luke A. Port House (now Deepwood Museum and Gardens) was built in 1894 and was designed by William C. Knighton. It is in the Queen Anne style and features multiple beautiful Povey stained glass windows. In the 1970’s the house was under threat of demolition, but a group of citizens banded together and successfully saved the home and grounds. The house is now owned by the City of Salem, managed by the nonprofit Friends of Deepwood, and is open to the public. The home and grounds are used for tours and events. The original kitchen was an unfitted Victorian Era kitchen, which typically would have consisted of a stove room, dry goods pantry, butler’s pantry, service porch, a connection with a servant’s stair, and sometimes a cold room. The kitchen was “updated” in the 1940’s. The servant’s stair entry was eliminated, the original Victorian kitchen elements torn out and replaced with a 1940’s kitchen. Over time, the 1940’s kitchen had been compromised by further “updates” that created more cognitive dissonance within the context of an 1894 house museum. Fortunately, the butler’s pantry had been left intact. Restoring the Victorian Era kitchen was financially beyond the means of the grant. *They understood that a Victorian kitchen would not provide them with the functionality they required. Karla met with the Executive Director, Lois Cole, and discussed the situation. After assessing the budget, the needs of the museum, and kitchen space Karla came up with a recommendation. She suggested restoring and incorporating the 1940’s kitchen into the interpretation of the museum. The 1940’s kitchen was over 50 years old, was now an integral aspect of the building, and could meet the current needs for catering and events. Most of the important elements of the 1940’s kitchen were still intact. Karla walked Lois through the idea, and she could see that restoring the 1940’s kitchen was the path to meet the museum’s goals within the means of the grant. The kitchen was not interpreted and restored to the original 1894 Victorian design. However, the decision to restore the 1940’s kitchen did preserve a piece of the history of the Luke A. Port House. 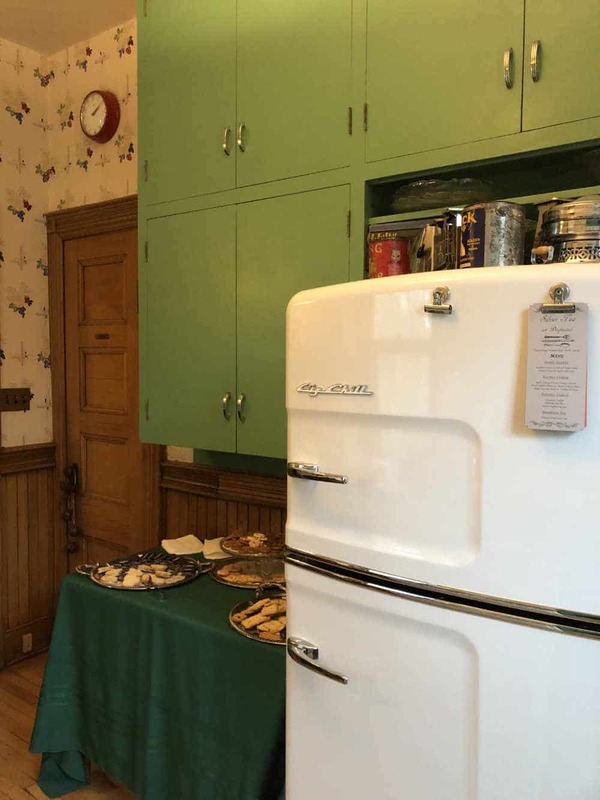 Incorporating the 1940’s kitchen also provided the Friends of Deepwood the functionality required for them to hold events that support the operations of the museum. The kitchen has a very vintage feel to it, which feels quite appropriate for this lovely historic resource. Enough 1940’s kitchen wallpaper to cover the entire room. Sourced a vintage stove and had it serviced to be fully functional. Sourced reproduction Formica for the counter tops, complete with the metal edging. Sourced a Big Chill refrigerator with the vintage look and required compacity. Sourced appropriate linoleum color selections. Karla also recommended leaving the stainless steel fronted commercial dishwasher in place as a commercial dishwasher was a requirement for the events. There were no fully integrated, panel ready commercial dishwashers available at the time of this project. Visit Deepwood Museum and Gardens website.